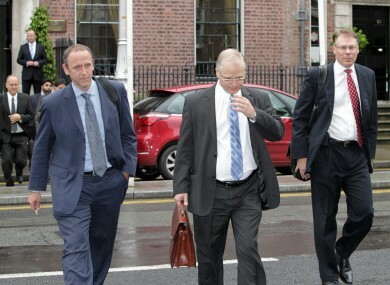 Officials from the EU, IMF and ECB arrive in Dublin today to conduct their tenth review of Ireland’s bailout programme. DISCUSSIONS OVER THE rejection of a new public sector pay deal – Croke Park II – are likely top the agenda as the Troika begins its tenth review of Ireland’s bailout today. Officials from the European Commission, International Monetary Fund and European Central Bank arrive in Dublin today to meet with government officials as Ireland looks to advance its progress on exiting its bailout programme at the end of the year. But the meetings this week come in the wake of the rejection of the public sector pay deal by unions last week forcing the government into a rethink of how to save €300 million from the public sector pay bill this year. The government will have good news though having reported yesterday that its deficit target had come in below expectations as it looks to reduce it to 3 per cent of gross domestic product by 2015. Yesterday, a European Commission report on Ireland’s progress called for the government to outline where it will continue to cut back in expenditure over the next three years. “The Troika has once again encouraged the authorities to spell out the policy intentions in the key spending areas of education, health and the welfare sector to buttress the credibility of their announced consolidation path,” the report said. The visit will also come in the wake of comments from the former head of the IMF mission to Ireland, Ashoka Mody, that the austerity-only policy in Ireland was a mistake, comments which IMF officials now working in Dublin are likely to distance themselves from. Officials from the Troika will meet with members of the opposition parties and some independent TDs on Friday. Email “Talks on public sector pay likely to top agenda on latest Troika mission”. Feedback on “Talks on public sector pay likely to top agenda on latest Troika mission”.